Cognitive exercises for adults can help keep their minds sharp and alert while reducing the risk or delaying the onset of age-related dementia. 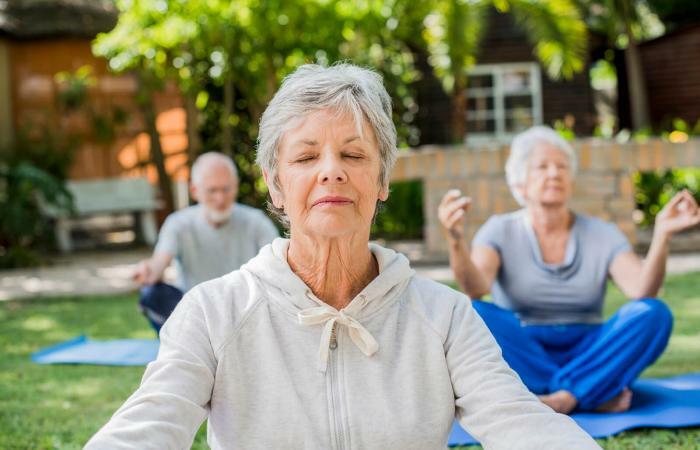 Explore mind stimulating games for seniors like card games and puzzles or hobbies that can improve their quality of life while boosting cognitive functioning. Even the sharpest seniors show small signs of cognitive decline. Memory, processing speed, and reasoning all tend to decline gradually as one becomes older, even for those who do not have any other brain-related diagnosis. For others, cognitive decline occurs more quickly and is the result of an illness or a condition like Alzheimer's disease, multiple sclerosis, or Huntington's disease. Just as the body needs physical exercise to keep fit, the brain needs mental exercise to keep sharp too. Mental exercise stimulates the brain, often providing long-lasting positive effects regarding thinking and reasoning skills, memory and processing speed. Declining cognitive skills can negatively impact an elderly person's quality of life and make acts of daily living more challenging. There are many types of activities that help maintain and improve the cognitive skills of elderly individuals. These include everyday activities, puzzles, crafts, and games. One of the most important cognitive activities for the elderly is engaging in meaningful conversation. Often as people age, they withdraw from social interaction, giving them fewer opportunities to talk to others about things that are important to them. Asking their opinions about situations and events can stimulate their mind and boost their mood. Slightly changing an everyday activity is another way to enhance cognitive skills. Examples include using the opposite hand when brushing your teeth, writing your name, or dialing a telephone. Learning a new hobby or taking up a craft are excellent ways for elderly individuals to keep their brain active and alert. Many of these activities also help in maintaining eye-hand coordination as well as fine motor skills. 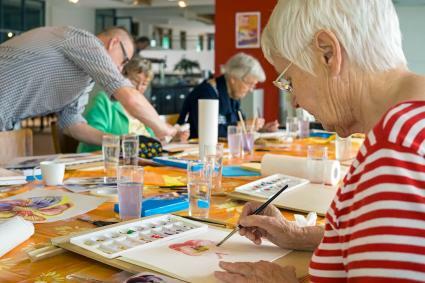 If the person has a physical limitation such as arthritis, modify a craft or hobby in ways they can still enjoy being part of experiences that make them happy. Working with watercolor paints is a great choice for those who have difficulty with eye-hand coordination but enjoy artistic activities. Watercolors are very easy to manipulate, layer and alter. Ask them to create an abstract image of their mood on a daily basis. This will not only help them continue to work on their physical coordination, but will also encourage them to self-reflect on their emotions. A very large brush is easier to hold and maneuver. A larger canvas helps too. Pastels are easy to hold, can be smudged with your fingers or hands, and can be removed easily if mistakes are made. Ask them to draw a scene of anything that helps them feel calm and relaxed. This could be a color, a place, or a person. Give them total creative freedom and allow them to work out a piece that is meaningful to them. Pastels can be purchased in larger sizes, so they are easier to grip. Once finished, the drawing can be framed and hung as a reminder of something that makes them feel at peace. Spend some time helping them create a compilation of music that reminds them of positive memories or just makes them feel good. Research notes that listening to music can help boost cognitive performance, mood and attentiveness. This playlist can be played during other activities, or during meditation. Once the playlist is complete, lead a guided meditation and ask how they feel when you're done. If physical abilities are not an issue, spending time in nature has been shown to promote feelings of relaxation, independence, and socialization. 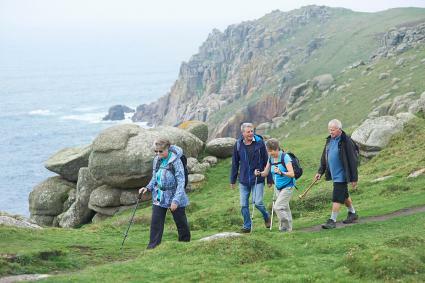 Organizing a nature walk in a beautiful area can help elderly folks feel connected to themselves and their surroundings. Take some time to research an area and point out interesting plants, animals and landmarks. What does the sensation of walking feel like on the feet, hands, face, and other parts of the body? What does being outside feel like, smell like, look like and sound like? What emotions come up when walking quietly outside? Playing games and solving puzzles are excellent cognitive activities for elderly individuals. These types of activities engage and stimulate the brain in a fun, interactive way. Many websites offer games and puzzles modified for seniors with physical limitations. These include puzzles with oversized pieces, large print puzzle books and playing cards. Find these types of games at The Senior Store and Games Unlimited, among others. Offer around 100 mosaic tile pieces and ask them select an image they'd like to replicate using the tiles. This could be a photograph, a magazine picture, or an interesting print. Allow this to be an ongoing project they can work on. This project engages their problem-solving skills, spatial skills, ability to concentrate, and creative abilities. Mosaics can be placed on ceramic pots, plates, or simple plywood. Create an indoor or outdoor scavenger hunt, using a camera to capture images of the appropriate people, places, or objects. Come up with a list of at least 10 clues to seek out. Clues can range from easy to more challenging depending on the individual's cognitive abilities. This game engages the ability to concentrate and problem solve, and it gets them moving too. Cognitive activities for elderly individuals helps to keep their minds alert and actively engaged in life. Activities for the elderly should always be age-appropriate as it is important to maintain the individual's self-respect and dignity.